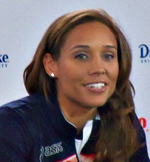 Iowa native Lolo Jones has drawn a lot of attention after qualifying for the bobsled competition in the winter Olympics. Jones failed in two attempts to win a medal in the 110-meter hurdles at the last two summer Olympics. She has often gotten as much or more attention for her looks and tweets on being a virgin, than she has her athletic ability. That attention now includes a parody by the Onion.